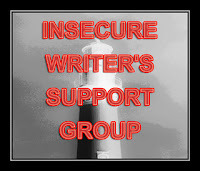 It's the first Wednesday of the month, so you know what that means ... it's time for another Insecure Writer's Support Group meeting. IWSG was created by the awesome ninja captain Alex J. Cavanaugh, and you can find out the other members of the group here. One of the best things about being a writer is being creative. I get to expand my creativity muscle and exercise my imagination. Something should get exercise, right? One of the reasons I enjoy my Foxwick world so much is because there is so much creativity in it. I’m the goddess of this world. I can build lands, create creatures and people, and control their lives—when the characters let me, that is. It can also be worrisome creating a new world. What if the readers don’t like the world? What if it is too weird? Too mundane? What if I forget something or decide to change it mid-way through the story and forget to reflect that in the previous stories? I keep notes and update information that changes through the course of writing. But there are those worries. In the end, the risk is worth the reward. How do you flex your creativity muscle? That's what makes fantasy such a challenge - the world building. But if you're organized, you can pull it off. That's right. Something has to get exercise, hahaha. I hear you there. I think creativity is the thing I exercise the most. Funny thing is I believe it is perfect until someone tells me there's a problem with it. Then I toss it out the window and make a new thing I believe it's perfect until pointed otherwise. I go for a run. That's how I get mine warmed up, and then I just let it flow for whatever I need it for: writing or photography. I love the creative aspect of writing. I think that's my favorite part! C is indeed for Creativity. In fantasy creativity can build a wonderful new world. Music always helps my creativity flow. Creating worlds, and the creatures and people to inhabit them is one of my favourite things about writing too. but yeah, it's hard to keep track of sometimes. Writing is my creative outlet too. It's my favorite medium. Artists have their watercolors and canvas, I have my keyboard and blank pages. And I agree that world building can be daunting and yet SO rewarding when you are finished.Keep up the good work Cherie. You always do an amazing job! I've never tried world building but it seems like a real challenge to me. I'm impressed by all of you who do it! I create a soundtrack for each project that I'm working on to immediately immerse me into the world I'm creating. I add to it as characters evolve and bring their friends! "Expand my creativity muscle and exercise my imagination. Something should get exercise, right?" Made me snort. I love the creative aspect of writing and if you love your world, your readers will too. "Something should get exercise, right?" Writing is my creative outlet, too. And I love creating fantasy because I get to be in charge of everything. It's thrilling and terrifying all at the same thing. Like I imagine sky diving would be. I created a different sort of world in my novella and I worry that it might be too off the wall. We shall see...today's post includes part of that world. I just completed a draft on my first novel after 30+ years of writing nonfiction. My muscles are definitely flexed creatively and challenged daily. Gotta keep notes! You should see my binders full of notes and research... my map on my wall... I love being creative with fantasy. But my creativity doesn't stop there. I make jewelry, I craft, I do all sorts of things. Great C post! I don't build worlds the way that fantasy authors do. However, I do build towns which is pretty much it's own little world. It kind of reminds me of playing The Sims, where you sort of play God. I love finding that creative part of myself too through writing. It's a part of myself I never thought I had. Whether I get published or not, I'm enjoying the process. The best way for me to flex creativity is to consciously work at it. I ask myself: what if? and then start writing...because if nothing else, creativity requires effort, and the more effort, the better the result. I love fantasy and the ability to decide my character's destiny (sometimes - if they let me). If I'm stuck on a project I jump onto the next one to get some time away, or read a book off my TBR. Usually that's enough to get the creative juices flowing. well hey Cherie - just three days into the A to Z challenge and I am in seriuous need of some creativity.. I love world building. I'm flexing my creative muscles all the time. My brain doesn't shut up. I just need the time to type it all down! I like trying to find space for creativity in projects that I'm ghosting on, adding touches wherever I can to try to make it better. How do I flex my creativity muscle? Sometimes getting up in the morning does the trick. :) Reading something I really wish I'd written; putting myself into my characters' heads, seeing through their eyes -- they show you such amazing things! I enjoy the creativity of others more than being the creator. I'm a reader more than a writer, a dancer rather than a choreographer, a pianist not a composer. Blogging is my little slice of personal creativity. Writing, photography and planning different and interesting English classes do it for me. It's tough being creative enough because there's so much pressure these days. You have to be so original and it seems like everything has already been done. But, the challenge of trying to be creative and original is kind of fun. Hopefully, your readers will appreciate whatever approach to it you can muster. Yessss, I love being creative too! It makes life so very interesting! I'm working on a fantasy novel, and am really enjoying building my world. I do some free-writing to stretch the creative muscles. After that, I just dive into the WIP. I often have this same worry, too. As daunting as world-building can be sometimes, it's still fun at the end of the day, so you're right, the risk is most definitely worth the reward! Finally after a lot of research I found another writer presenting little by little her fantasy world! I exercise thinking about mine all my spare time! And thinking and modifying the reality itself I’ll end up having the details I need. Although I need more time to finish the world building I think I’m on the right way! I try to create every day. Sometimes it is very simple things like dinner. Most often it is writing or painting or making mosaics. Thanks for your post Foxwick sounds like a wonderful place.